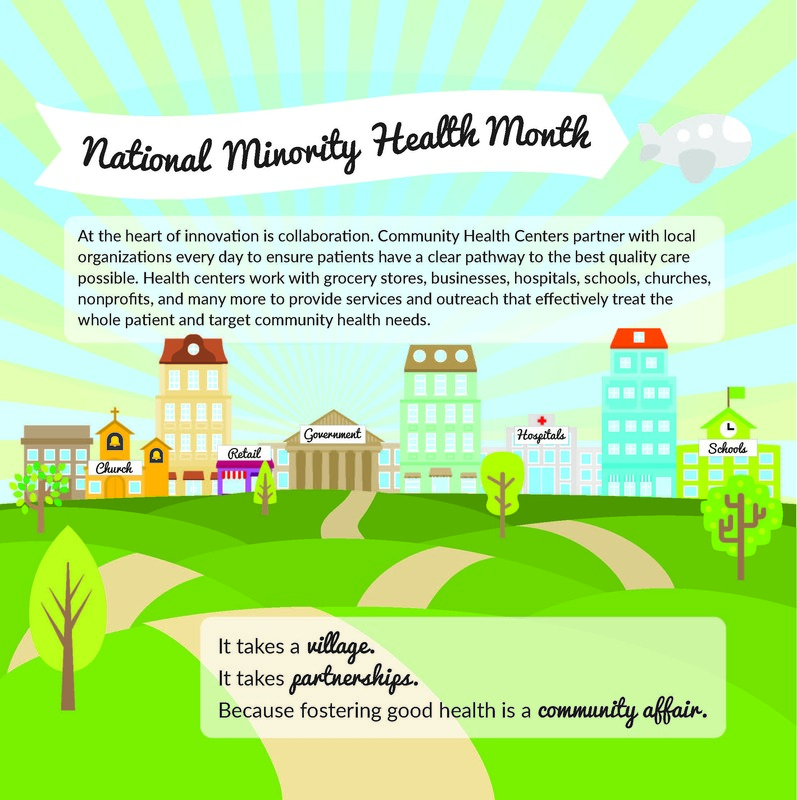 Happy National Minority Health Month! 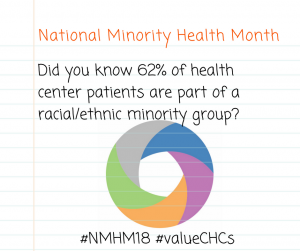 The theme for #NMHM18, Partnering for Health Equity, highlights partnerships that help reduce health disparities. 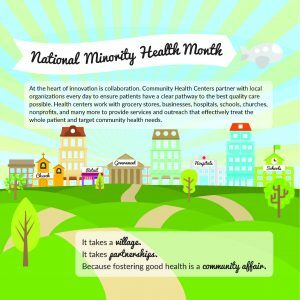 As innovators in the health system, Community Health Centers often partner with local and national organizations to ensure patients have a clear pathway to health care. These collaborations foster programs that address important health issues like food insecurity, clinician shortages, hypertension, housing, disaster relief and other emerging problems that can adversely affect population health. The project Community Health Centers as Food Oasis Partners: Addressing Food Insecurity for Patients and Communities (completed with support from the Medtronic Foundation) demonstrates the innovative and promising practices health centers use to address food insecurity in their communities. Food insecurity, which is defined as difficulty in accessing affordable nutritious food, affects approximately 14 percent of our nation’s population and is linked to poor health and economic outcomes. Health centers work with local partners to cultivate community gardens, farmer’s markets, food pantries, grocery stores, and more to combat food insecurity. Learn more. Health centers also collaborate with the Centers for Disease Control and Prevention and local partners for the Million Hearts Initiative. Million Hearts aligns national efforts to prevent heart disease and stroke with a “select set of evidence-based public health and clinical goals and strategies.” ARcare, a health center that participates in Million Hearts, partners with the local public health department and local university pharmacy students to support their care model around self-measured blood pressure monitoring (SMBP). Samuel U. Rodgers Health Center has a partnership with the Kansas City YMCA. The Y’s Healthy Heart Ambassadors visit the health center twice a week to train patients on SMBP and provide a lifestyle education program. Read more about Million Hearts and health center efforts. NACHC and health centers also work with education partners to identify and train providers to address the shortage of primary care providers in underserved communities. These educational partnerships strengthen programs and allow staff to boost their skillset in the broader effort to deliver value-based care. New partnerships with Colorado State University-Global Campus, New England College, New England College of Business and Western Governors University build on the pioneering academic partnership with A.T. Still University, a long-time NACHC ally and supporter of health centers on workforce building initiatives like the Hometown Scholars Program. Learn more. These are just a few of the partners’ health centers work with to provide access to quality, affordable care to 27 million patients in communities across the United States. For health centers, collaboration is really at the heart of innovation because they know that fostering good health is a community affair.